Olav Einar Rygg of Export Credit Norway says attractive financing could make retrofit investment less demanding. In light of tightening international regulations on ballast water management and a global 0.50 percent cap on sulfur in bunkers set for 2020, Norway's government-owned Export Credit Norway today announced that it will offer financing to international vessel owners who purchase retrofit equipment from Norwegian suppliers. "Money is tight and access to reasonably priced capital is a challenge for many players in the international shipping and maritime industries at the moment. Hence, attractive financing of retrofit equipment could make the investment less demanding for many vessel owners," said Olav Einar Rygg, Export Credit Norway’s Director of Lending, Ocean Industries. The organisation says analyses indicates that as many as 60,000 vessels will need to be retrofitted scrubber systems by 2020 and ballast water treatment systems by 2021. Export Credit Norway will now be able to finance up to 85 percent of the contract value for retrofit equipment that international vessel owners acquire from Norwegian companies where Norwegian content accounts for at least 30 percent of the amount of the Norwegian supplier contracts. "The Norwegian shipping and maritime industry has a number of world leading technology suppliers within ballast water treatment systems and other required retrofit systems. What we provide is attractive financing for vessel owners who are interested in purchasing this technology," said Rygg. Depending on the economic life, amount and type of investment, the maturity of the retrofit loans will be between 5 and 8.5 years per single loans. 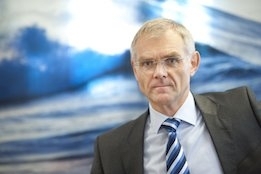 "For ship owners that have several vessels that need to retrofit equipment, Export Credit Norway can offer a credit frame agreement for the entire fleet," explains the organisation, noting that loans for the purchase of the retrofit equipment will then be structured as single loans under the credit frame agreement. Under the new offering, Norwegian shipping companies will also be able to apply for financing of retrofits at Norwegian shipyards for vessels that will be engaged in foreign trade or will generate revenue in the offshore market.